Devex Systems’ Xcable™ CK-17 electric floor heating cable uses a twin conducting heating cable for ease of installation. 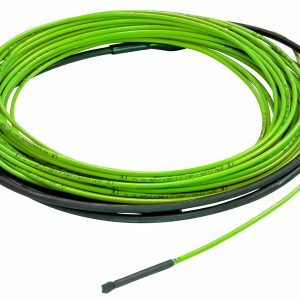 This flexible cable made with fluoro-polymer and durable PVC outer sheath can be easily installed directly on a structural slab, fibre cement sheet, or F-Board insulation and into 20-25mm screed bed. This system best operates on a “time of use” tariff as it is quick to come to the desired temperature. The X cable is rated at 17 watts per meter and comes with a 3m single cold tail. The cables comply with IEC60800:2009. We recommend the use of F-Board Insulation with electric floor heating to improve warm up times and reduce running costs. Devex Systems’ Xcable™ CT-30 electric floor heating cable can be installed into concrete slab under a wide range of floor coverings. The CT-30 has a very low EMF and its single cold tail makes it easy to install. The CT-30 is most suited to be connected to an “Off-Peak” or “Time of Use” tariff as an in-slab storage heating system. This cable’s steel armor and multiple layers of conductor insulation make it extremely durable and also able to be used for snow melting. The cable is rated to 30 watts per meter and it comes with a single 3m cold tail. We recommend the use of Extruded Polystyrene (XPS) Insulation with electric in-slab heating to improve warm up times and reduce running costs.